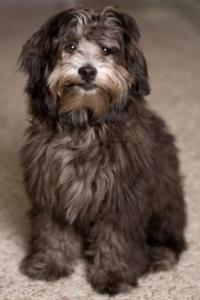 A lhasa apso poodle mix is a cross between lhasa apso and poodle dogs. They are also called a lhasa poo. Lhasa apso dogs are active dogs who have stubborn streaks. If the owner is stubborn, too, it can make for a fun ride to see who wins! They're playful and shy around people they don't know. They can take a while to warm up to strangers. They have average intelligence and are not easy to housetrain. It may take longer than normal to potty train these dogs. Prospective owners of these dogs would be wise to invest in a book or video on housebreaking. It would also be a good idea to invest money in a training class. This will reap huge rewards for the future. Lhasa apso's are not easily trained but if the dog inherits the poodles' intelligence, training may be easier. This mixed breed dog will vary in weight and in size depending on whether his poodle parent was a toy, mini or standard poodle. Most of these dogs tend to be smaller dogs. If the puppy acquires primarily the lhasa apso coat, it will shed and will not be allergy free. As such, these dogs will not be suitable for families where one or more family members have pet allergies. 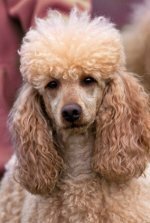 Coat colors will vary depending upon the color of the poodle parent. Most of these dogs will tend to have darker color coats. These mixed breed dogs will live up to 15 years. They need average amounts of exercise. Plan on one daily walk a day and incorporate other playtimes into his day. 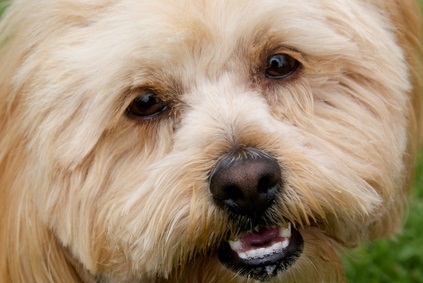 Your lhasa poo will be a loving and loyal housemate for a lot of years. Enjoy and love your dog as he grows from puppyhood into adulthood.